Where ever possible we use local suppliers this enables us to use the best fresh ingredients available, and ensure our custumers come back time and time again.Some have been supplying us with fresh quality produce for over 20 years. W. HARVEY & Sons. Newlyn Cornwall. Proper Cornish Ltd. Bodmin Cornwall. Award Winning: Hand Made Cornish Pasties. National & International Award Winning Wines. Healy’s Cyder Farm Penhallow Nr Truro. Rattler Apple – Pear & Berry Cyder. St. Austel Brewary Company Ltd. Tribute – Cornish Premium Ale. Run by the Lindo family since planting the first vines in 1989, the neighbouring Camel Valley Vineyard is situated on the south facing slopes above the River Camel. 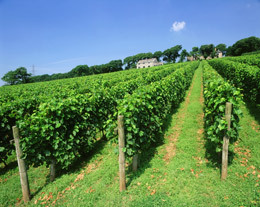 The wide range of wines have consistently won top major national and international awards. The Vineyard being a short 3 - minute drive, or a 10 minute walk away from us.